To explore the relative contribution of novel and traditional risk markers for diabetic retinopathy (DR). A clinic-based study of 224 diabetic patients (85 type 1, 139 type 2) from a diabetes clinic was performed. DR was graded from fundus photographs according to the Airlie House Classification system and classified as absent or present (at least ETDRS level 14). Novel risk markers assessed included serum apolipoprotein (Apo) AI and B, skin microvascular responses to acetylcholine (endothelium-dependent) and sodium nitroprusside (endothelium-independent) iontophoresis, flicker-light-induced retinal vasodilation and retinal vascular tortuosity. Relative contribution was determined by semi-partial correlation coefficient generated from a logistic regression model containing all traditional and novel risk markers simultaneously. There were 144 (64.3%) participants with DR. Of the novel markers, ApoAI, flicker-light-induced vasodilation and retinal arteriolar tortuosity were significantly associated with DR, independently of traditional measures (all p < 0.03). 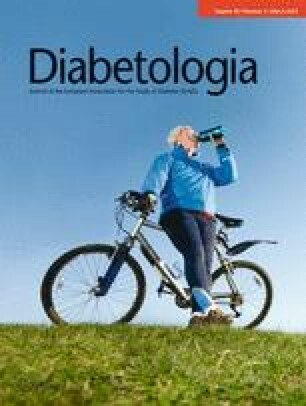 Diabetes duration contributed most (51%) to the risk of DR, followed by ApoAI (16%), systolic blood pressure (13%), retinal arteriolar tortuosity (8%) and flicker-light-induced venular and arteriolar dilation (3% and 0.5%, respectively). ApoAI and retinal arteriolar tortuosity made considerable contributions to DR risk, independently of traditional risk markers. Findings from this study suggest that serum ApoAI and retinal arteriolar tortuosity may be novel and independent risk markers of DR. The online version of this article (doi: 10.1007/s00125-011-2424-x) contains peer-reviewed but unedited supplementary material, which is available to authorised users. It has been well established that diabetes duration, HbA1c and blood pressure are the strongest risk factors for diabetic retinopathy (DR) . However, there is increasing evidence that these traditional risk factors do not fully explain a person’s risk of having DR , highlighting the need to identify novel risk markers. In line with this, studies have shown that DR is associated with various novel markers, such as serum levels of C-reactive protein and soluble cellular adhesion molecules . However, whether these novel markers have additional predictive value in DR is uncertain. In previous reports, we have also demonstrated that several novel systemic and retinal risk markers, including serum levels of apolipoprotein (Apo) AI and B , skin microvascular responses to sodium nitroprusside (SNP) and acetylcholine (ACh) iontophoresis , flicker-light-induced retinal vasodilation  and static measurement of retinal arteriolar tortuosity from photographs , are independently associated with DR. However, there are no data on whether these novel markers, in isolation or in combination, add to traditional risk factors in predicting DR.
Identifying novel markers for DR that contribute substantially to DR risk in addition to traditional risk factors will lead to improved clinical management of DR. In this study, we therefore aimed to assess the relative contribution of these novel risk markers for DR in comparison with traditional risk factors in a clinical cohort of patients with diabetes. We recruited 224 patients (18–70 years of age) with diabetes (85 with type 1 and 139 with type 2), as previously described [4, 5, 6, 7]. We excluded participants who had a history of epilepsy or glaucoma, had undergone previous vitreal surgery, and/or had a cataract on examination. The study followed the tenets of the Declaration of Helsinki and was approved by the local ethics committee, with written consent from each participant. DR was graded from two-field fundus photographs at the Centre for Eye Research Australia, by graders blinded to clinical characteristics . The DR grading was performed following the modified Airlie House Classification system , and classified as DR present or absent. The presence of DR was defined as any retinopathy signs in either eye (Early Treatment Diabetic Retinopathy Study [ETDRS] level 14 or greater). Detailed blood specimen handling and assessment of blood glucose, HbA1c, lipids and apolipoproteins have been previously described . Briefly, serum ApoAI and ApoB were assessed using rate immunonephelometry (BN II Nephelometer Dade Behring, Siemens Healthcare Diagnostics, Eschborn, Germany). Intra-assay CVs for Apo AI and ApoB were 2.2% and 1.9%, respectively, and inter‐assay CVs were 5.7% and 2.4%, respectively . This was measured using a laser Doppler flowmetry technique to assess response to iontophoresis of SNP and ACh . Iontophoresis delivers vasodilators (SNP and ACh) across the skin using a weak electrical current, with blood flow measured by laser Doppler flowmeter (Moor Instruments, Axminster, UK) . Assessment of flickering-light-dependent vasodilation was performed using The Dynamic Vessel Analyzer (IMEDOS, Jena, Germany) . Retinal arteriolar and venular dilation in response to flickering light was represented as the mean increase in the vessel diameter in response to light flicker during the three measurement cycles and was expressed as the percentage increase relative to the baseline diameter size. Retinal vessel tortuosity was quantitatively measured from digital disc-centred retinal photographs (field 1 of the ETDRS photographic fields), using a semi-automated computer program (Singapore I Vessel Assessment, Singapore). Detailed measurement procedures have been previously described . A summary of tortuosity indexes of all arterioles and venules was generated by the software separately, calculated using the integral of the total squared curvature along the path of the vessel divided by the total length of the vessel arc. All participants underwent a standardised clinical examination and interview using a detailed questionnaire to obtain information, including medical history, current cigarette smoking status, and the use of antihypertensive, lipid-modifying and oral diabetes drugs. Hypertension was defined as systolic blood pressure (SBP) ≥140 mmHg, diastolic blood pressure ≥90 mmHg, or current use of antihypertensive drugs. Height and weight were measured to determine BMI . We performed the statistical analyses using Intercooled Stata version 10.1 for Windows (StataCorp, College Station, TX, USA). We developed a logistic regression model containing simultaneously traditional risk factors (diabetes duration, HbA1c, SBP) and all the novel risk markers mentioned above, plus the use of insulin, oral diabetes and lipid-modifying drugs. We used post hoc estimation to obtain semi-partial correlation coefficients of all significant independent variables in this model, to determine the relative contribution of each of these variables to the odds of having DR. Finally, we assessed the clinical performance of these novel markers by plotting receiver operating characteristic (ROC) curves of traditional combined with novel markers and estimated the sensitivity and specificity of the model for DR discrimination. Of the 224 diabetic patients, 13.8% (31) had mild non-proliferative DR (NPDR), 22.3% (50) had moderate NPDR, and 23.3% (52) had vision-threatening DR (combined severe NPDR, proliferative DR, and/or clinically significant macular oedema). The median (interquartile range) age of our participants was 59 (51–66) years. Compared with participants without DR, those with DR were more likely to be male (62% vs 56%), had longer diabetes duration (18 vs 10 years), higher HbA1c level (8.0% [63.9 mmol/mol] vs 7.6% [59.6 mmol/mol]), higher SBP (130 vs 125 mmHg), and were more likely to use insulin (71% vs 58%). In the model, ApoAI, flicker-light-induced vasodilation and retinal arteriolar tortuosity contributed significantly to DR, independently of traditional measures (Table 1). Per SD increase in diabetes duration and SBP, the odds of having DR was significantly increased (OR 2.48; 95% CI 1.83, 3.35; per 10 years increase in diabetes duration, and OR 1.19; 95% CI 1.06, 1.36; per 15 mmHg increase in SBP). Each SD decrease in ApoAI (OR 1.41; 95% CI 1.05, 1.80) and flicker-light-induced arteriolar and venular dilation (OR 1.10 [95% CI 1.01, 1.19] and OR 1.16 [95% CI 1.08, 1.27], respectively) were inversely associated with DR, whereas each SD increase in retinal arteriolar tortuosity was associated with an increased odds of having DR (OR 1.29; 95% CI 1.03, 1.55). HbA1c, the use of insulin, diabetes and lipid-modifying drugs, serum ApoB, and SNP and ACh iontophoresis were not independently associated with DR in this model. Diabetes duration made the biggest contribution (51%) to the risk of DR, followed by ApoAI (16%), SBP (13%), retinal arteriolar tortuosity (8%) and flicker-light-induced venular and arteriolar dilation (3% and 0.5%, respectively; Table 1). The addition of ApoAI to traditional risk factors improved the AUC by >6%, and combined ApoAI and tortuosity improved the AUC by nearly 10% (Fig. 1). The addition of ApoAI and retinal arteriolar tortuosity to the model containing traditional risk factors did not much change the sensitivity of the model (77% to 78%), but improved substantially the specificity (from 47% to 72%), positive predictive value (from 67% to 74%) and negative predictive value (from 60% to 69%; electronic supplementary material [ESM] Table 1). In this study, we demonstrated that serum ApoAI, retinal arteriolar tortuosity and flicker-light-induced retinal vascular responses were independently associated with DR. ApoAI and retinal arteriolar tortuosity made a considerable contribution to DR risk. The addition of ApoAI and retinal arteriolar tortuosity to traditional risk factors substantially improved the clinical performance of the traditional risk prediction model and nearly doubled the specificity of the model. Interestingly, our findings show that the relative contribution of serum ApoAI to risk of DR is stronger than that of SBP, and that HbA1c level was no longer associated with DR after adjustment for these traditional and novel factors. However, we did not find a significant association between HbA1c and novel markers except for ApoB in our study. Therefore non-significant association of HbA1c with DR, and the smaller relative contribution of SBP to DR, may be due to confounding effects of treatment—the majority of our participants were receiving insulin and antihypertensive therapy. Our strengths included comprehensive assessment of novel markers for DR, standardised DR grading from fundus photographs, and our participants are typical clinical diabetic patients, the latter supporting the generalisability of our findings to a specific diabetes population . However, limitations are also acknowledged. First, the cross-sectional nature of our study limited the sequential interpretation of our findings. Second, our sample size was not sufficient to perform analyses stratified by diabetes type or DR severity. Future studies are needed to address this and validate our findings in a larger sample. In conclusion, findings from this particular sample suggest that serum ApoAI and retinal arteriolar tortuosity may be novel and independent risk markers of DR, which can be added to the traditionally used risk factors. Future trials targeted at improving serum ApoAI levels in diabetes management, and prospective studies investigating the clinical utility of retinal arteriolar tortuosity measured from photographs as a DR risk indicator are warranted. We thank C. Karschimkus and A. Januszewski (Department of Medicine, University of Melbourne, Melbourne, VIC, Australia) for technical assistance related to ApoAI and B assays, and C. Robinson for skin iontophoresis data analysis. The Centre for Eye Research Australia receives Operational Infrastructure Support from the Victorian Government. This study was supported by a Diabetes Australia Research Trust grant (to JJ Wang, TY Wong, JE Shaw and TT Nguyen) and by the National Health and Medical Research Council Centre for Clinical Research Excellence #529923–Translational Clinical Research in Major Eye Diseases. MBS contributed to study design, data collection, research, data analysis and interpretation, and manuscript writing. TYW obtained funding for the study, contributed to study design and data interpretation, supervised, contributed to discussions, and critically reviewed and edited the manuscript. TTN obtained funding and contributed to study design, data collection, research data interpretation and discussion. JES obtained funding, contributed to data interpretation, critically reviewed and edited the manuscript. AJJ contributed to data interpretation and discussion, and critically reviewed the manuscript. JJW obtained funding, contributed to study design and data interpretation, supervised, and critically reviewed and edited the manuscript. JJW and MBS take full responsibility for the article and its originality. All authors provided final approval of the version to be published.